A1 Restricted Licence Motorcycle Training Complete Package Deals From £465! Taking an A1 motorcycle training course is a good option if you’re 17 or over and want to ride a 125cc or you just find bigger bikes ‘too big’ but don’t want to repeat your CBT every 2 years. It gives you a full but restricted licence, thus you can ride any 125cc bike without L-plates, with pillions and on motorways! Once you're 19 you can step up to the A2 licence and ride the mid range bikes. You need a current licence with provisional motorcycle on it along with a current theory test certificate prior to any A1 training. You can book your theory test with the DVSA here. We also provide A1 training on a daily basis which is great if you want to use your own bike or have a current CBT so don't want the whole package. What Does A1 Motorcycle Training Involve? There’s very little difference in the training between A1 (previously known as A2), the new A2 & Cat A (was DAS) in that the tests are the same, Module 1 with the on-site maneuvers and Module 2 with the road ride. The tests last the same 15/20 mins for Mod 1 & approx. 40 mins for Mod 2. The A1 training is therefore very similar, but you won’t need a conversion to a larger bike, or time to get used to a different bike, as all your training will be on a 125cc which you would probably have completed your CBT on. However, unlike the CBT, there is no set syllabus for A1 training, at MTS Sussex we will help you become a safe and competent rider whilst covering everything you need for the big day and beyond! At the end of your A1 training you need to complete 2 DVSA practical motorcycle tests; Module 1 and Module 2. For more information see our Guide to a Full Motorcycle Licence and Frequently Asked Questions. At MTS Sussex we like to cover as much everyday riding as possible, including things such as riding in quiet and built up areas, town centres, junctions, roundabouts, country roads, and dual carriageways. You’ll learn effective use of gears, observations, signalling, positioning and much more. And of course there’s the preparation for the Module 1 test too. Module 1 maneuvers will be covered throughout your training with MTS Sussex, so by the time you go to test you should be confidant with each maneuver. After the test there’s a debrief explaining the results, then, all going to plan we can get your Module 2 booked if we haven’t already done so, that is your option which we will explain and discuss with you when we arrange your training. At MTS Sussex you will get plenty of opportunity for everyday riding from our centre in Haywards Heath, West Sussex to prepare you for your Module 2 Test. We will ensure you are confident in riding in quiet and built up areas, town centres, junctions, roundabouts, country roads, and dual carriageways. You will be taught the essentials such as use of gears, observations, signalling and positioning - and so much more! Don’t forget at MTS Sussex we don't only offer set package deals, we also personalise the amount of training to suit you, so if you have previous experience we may be able to reduce the amount of training you need, saving you time and money! We can talk to you about this, or you can come along to MTS Sussex for a free motorcycle training assessment, either way just get in touch and we’ll sort something out that suits you. Complete Package Deals: From £465! 3 day A1 package - just £465. This includes your CBT on the 1st day, the remaining time is test training and the tests themselves. Once again all inclusive of bike (and protective equipment if needed), insurance, CBT certificate and test fees. You will need to complete your theory test prior to your training. Apart from the CBT, these prices do not include fuel which is the responsibility of the student. 4 day A1 package - just £565. Once again, this includes your CBT as your 1st day, the rest as above. Personalised A1 Daily Training: From £130! If you already have a CBT and just want A1 training our daily rate is £130.00. This is all inclusive of clothing, insurance and bike use. This does not include fuel which is the responsibility of the student. If you decide to use your own bike for your training & tests, Please make sure your bike is road worthy/legal, insured and displaying L-plates front and rear. Also please remember all running costs throughout the course are your responsibility. Remember too as everyone is different, that quoting for the training you need, often means you pay less than you might for a set course. 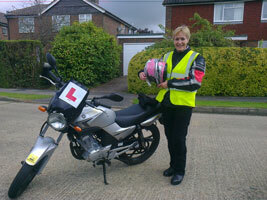 So if MTS Sussex is your choice for your motorbike training; please get in touch. To book your motorcycle training with MTS Sussex call us on 01444 246714, 01293 850802 or 01342 890006, email us at [email protected] or use the on-line contact form.